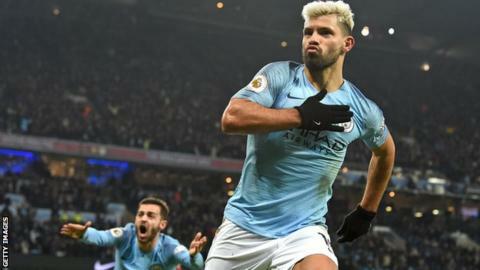 Manchester City’s victory over Liverpool reduced the Reds’ lead at the top of the Premier League to four points and reignited a three-horse title race – with Tottenham also in the mix. Leroy Sane scored the winner after Roberto Firmino had levelled in the second half, following Sergio Aguero’s opener at Etihad Stadium on Thursday. A game low on real quality was packed with high-profile incidents and had the watching world gripped to their sofas, and their smart phones. Dan Middlehurst: I’ve got a sneaky suspicion that the John Stones clearance might be one of the defining moments of the season. Harrison Short: Pretty much exactly the same tackle Kompany made in a Manchester derby a few seasons back, after which he was sent off. Lucky boy this time around. Loz Smith: Any other player and that’s a red. There is a massive love-in for Kompany because he’s a “nice guy”. Chris: Kompany very lucky there – out of control scissor action is usually a straight red. Adeyemi Adisa: Sergio Aguero is simply the definition of a world class finisher! Eddie: What a goal that is from Kun Aguero. Lasers the ball into the roof of the net from a near-impossible angle. Could have taken off Alisson’s head. Top drawer stuff!! Neil Boughton: Aguero, best striker in the league, does it again. Kolo: Bobby Firmino… Peach of a player. BakaOmubo: Robertson is bargain of the century. Jamu Ngaji: Man City’s Sane was having a game of a lifetime. Nice to cap it with a goal. David Jarvis: Can someone explain how Sane didn’t get to last to year’s World Cup? Phil Knight: Touchline ban for Pep surely? Over aggressive use of a scarf. Anthony: Fantastic advert for the Premier League that was, that’s why it remains the most thrilling and arguably the best division in world football, no doubt. meBADDEST: What a game!… what a night!.. premier league at it best… I don’t think have ever seen a Guardiola team under so much pressure in a game. Matt: That was such a good game of football. 100 miles an hour for 95+ minutes. Honestly I’d do away with the league structure and just have these two play each other every week. Kyle: Brilliant game between 2 superb sides. Liverpool weren’t at their best. City deserve a lot of credit for that the quality of the City goals were outstanding. Sane was superb and man of the match for me. Great 3 team title race we have now.